There are currently 5,206,652 pages available, from more than 800 newspapers from 25 states, and the database is expanding. 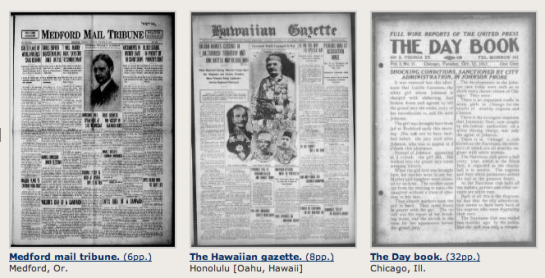 This is part of a long-term effort to develop an Internet-based, searchable database of U.S. newspapers with descriptive information and select digitization of historic pages. The project started in 2007, and was done by various grant recipients who digitized approximately 100,000 newspaper pages representing that state’s regional history, geographic coverage, and events of the particular time period being covered. Participants digitized primarily from microfilm holdings, and digitized at high resolution, greyscale. So far, the National Endowment for the Humanities has given $22 million to 32 state libraries, historical societies and universities to digitize. That works out to $4.23 per scanned page. In 2011, the site averaged 2.5 million page views per month. Read more in LOC press release.